A few years ago, I went to Iwate Prefecture, a region in Japan struck by the Great East Japan Earthquake and Tsunami, to do some volunteering. For a week, I was to play with the children who come to the small playground run by an NGO based there. These children lived in temporary housing near the playground, series of tiny two-roomed boxed homes with thin, poorly-insulated walls. Priding myself in being good with kids, I was confident I could become their best friend in a few minutes. But upon meeting the three fourth-grade girls I was to play with for the next few days, I was met with kicks and punches. Literally. I tried to approach them once more only to be kept at bay with crude words and additional kicks and punches. Dumbfounded and defeated, I watched from afar as the three girls playing alone on the playground. The volunteer leader explained to me, “With all that’s happened to them with the huge earthquake and tsunami, these girls are afraid of getting attached to something or someone just to have them taken away.” I took this as a challenge to break down their protective barriers. It was only then that I realized that these girls were not like the children I usually played with. The tsunami had taken their homes, schools, friends, and families. I couldn’t ask who was picking them up because I wasn’t sure whether their family members were alive. Yet I had formed a friendship with them, only to become another one of their lost relationships. I could imagine them next week, kicking and punching the new volunteers in fear of getting attached to people like me. And I would no longer be there, living in my comfortable home in Tokyo. I went back to the region two more times within the next year, but I never saw the girls again. This experience was my bitter introduction to the activity called voluntourism, volunteering in a place where one is vacationing. It sounds good and rightly so: why not help out the “locals” while you’re in a region less fortunate than yours? I went to Iwate as an unskilled high school student, hoping to help and catch a glimpse of the damage from the Earthquake and Tsunami. I shopped and ate at local shops, saw the people working to reconstruct their community, and played with children who could use a playmate. However, if I learned anything from my experience, I can tell you that there is only so much you can do to “help” in such a short amount of time. Volunteering is dealing with people, and to truly help someone, you need to think about the long-term impact you will have on them. So please, when you consider volunteering at an orphanage in a developing country or helping to build a school, do research thoroughly on whether you will be a positive contribution to the community and its people. A few days ago, I went to an elementary school and community center in Lomas Del Valle to do some volunteering. As part of the Human Connections internship, we went to paint the walls of the school created by NGO Fundación A.T.D. 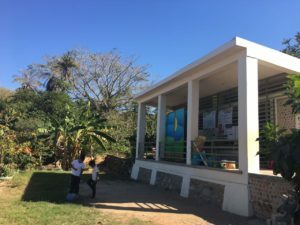 While we all recognized this as the classic negative example of voluntourism, the community directly expressed that they wanted the previously white walls of the classrooms to be painted in a darker color as to not show the dirt, and to last longer. We had a brief tour of the school and volunteered only for a fleeting three hours. However, this experience left me more comfortable with the impact of my actions than did my full week in Iwate. We were not taking jobs away from local people – we were instead taking on a job they had not been able to hire due to lack of funds and time. We were not simply recipients of the valuable experience – Human Connections gave a donation so that A.T.D. can hire painters to finish the project. We were not coming in for a day and then leaving – Human Connections has a sustainable relationship with Fundación A.T.D., which has been and will continue on long after I leave. The members of Fundación A.T.D. surprised us at the end of the day with a delicious Mexican feast with cooked beans, pulled-pork, and soft handmade tortillas. Our volunteer project was not a one-way charity case. It was a collaboration. Just as Fundación A.T.D. relies on volunteer contributions and donations to complete their school and community center, Human Connections relies on community relationships to advocate responsible tourism and extend its social impact. Our work was mutually beneficial. There’s a fine line between responsible and irresponsible voluntourism. In some cases, the best intentions may not bring about the best results. But if you know what you are providing and consider the long-term impacts, your contribution might make someone’s life a bit brighter.